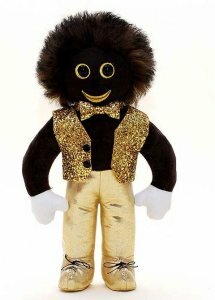 14" 2008, Dark brown velvet golly with gold embroidered mouth and eyes, black plastic eyes and a brown velvet nose, brown mohair hair. White velvet hands with thumbs. Gold lamé trousers and shoes, shinny gold vest and matching bow tie. Non jointed and will stand alone.